For fighter info, see Rosalina & Luma (SSB4) and Rosalina & Luma (SSBU). Official artwork of Rosalina from Mario Party: The Top 100. Rosalina (ロゼッタ, Rosetta) is a character from the Mario series. Rosalina is the adoptive mother of the Lumas, and is among the most powerful characters within her home series, as she watches over the universe in addition to taking care of the Lumas. Her debut as a playable character in the Super Smash Bros. series was confirmed on December 18, 2013 via Nintendo Direct. 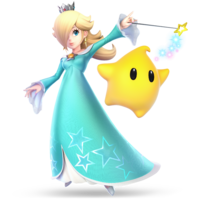 Rosalina is a youthful-looking woman whose appearance highly resembles Princess Peach. She has platinum blonde hair, styled into a bang that covers the majority of the right side of her face. She is also noticeably taller than Peach, and most Mario characters in general. 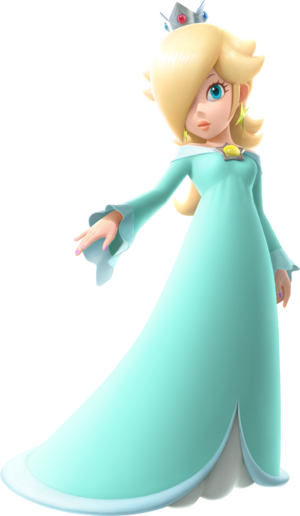 Rosalina's attire consists of a turquoise empire waist dress, with tapering sleeves and a low neckline that exposes her shoulders. Her earrings and brooch display star-shaped motifs, and she wields a wand which also sports a star-shaped motif on its tip. Rosalina debuted in Super Mario Galaxy, where she is a major non-playable character. She commandeers the Comet Observatory, which visits her home planet once every century, and functions as a home for both herself and the Lumas. Her backstory is detailed in a storybook, which she reads to the Lumas at various points during the game. The storybook reveals that Rosalina first journeyed into outer space to help a lost Luma find his mother, which eventually led to the duo building the Comet Observatory together, Rosalina coping with the death of her own mother, and subsequently forming a new familial relationship with the Lumas as their adoptive mother. 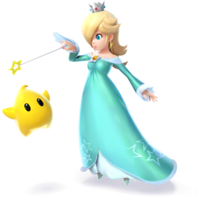 Although Rosalina has a vastly reduced role in Super Mario Galaxy 2, she made her first playable appearance in Mario Kart Wii, and has been playable within the Mario Kart series and a number of other Mario spin-off games ever since. Her first playable appearance within the main Mario series occurred in Super Mario 3D World, where she is the game's only unlockable character and can use the Spin from the Super Mario Galaxy games. Rosalina, as she appears in Super Smash Bros. 4. Rosalina is a newcomer in SSB4. In addition to her own moveset, she is allied with a Luma, who has its own moveset and can assist her with almost all of her attacks. Luma can be controlled along with Rosalina, which results in the pair adhering to the "puppet fighter" archetype, similarly to the Ice Climbers. Unlike in Super Mario Galaxy and Super Mario Galaxy 2, Rosalina's dress sports star-shaped motifs, and her high heels are colored turquoise instead of silver. Rosalina & Luma have a highly defensive neutral game, with Luma notably being able to shield Rosalina, and Gravitational Pull being able to render projectiles useless against them. When the pair are together, they can be difficult to approach, as one can cover the other and punish opponents when in danger. They also have good KO potential, thanks to Luma's standalone power and Rosalina's disjointed range. However, Luma can be KO'd temporarily; in addition to removing one of Rosalina's key strengths, a KO'd Luma renders two of their moves, Luma Shot and Star Bits, useless. Rosalina herself is also tall and very light, making her easy to launch. Rosalina's recovery move, Launch Star, is long-distanced and can be angled, but renders her vulnerable because of its lack of hitboxes. Overall, Rosalina & Luma's strengths largely outweigh their weaknesses, as they have enjoyed consistent and strong tournament results. As a result, they are currently ranked 5th out of 55 on the tier list, placing them in the A tier. The mysterious Rosalina lives in the Comet Observatory with the Lumas. In Smash Bros., Rosalina and Luma can fight in different places at the same time. If you can trap someone between Rosalina and Luma, you'll be able to unleash incredible damage with their joined attacks! Rosalina and the Lumas have been close ever since she travelled the galaxy with one to help the little star find its mother. Now, the commander of the Comet Observatory appears in this game, with her trusty companion fighting alongside her. Their greatest strength is being able to attack together at the same time. Rosalina can pull in items and projectiles around her with her Gravitational Pull move. Her up special Launch Star is a diagonal jump and, though harmless, it has exceptional range. You also have some control over Rosalina's trajectory when she uses it. With a flick of Rosalina's wand, the move Gravitational Pull draws in items - even ones that are stuck somewhere. Her Launch Star up special is a diagonal jump that can be aimed slightly. It doesn't deal any damage, but it helps you jump higher and stay in the air longer, making it ideal for getting back to the stage easily. Rosalina, as she appears in Super Smash Bros. Ultimate. Rosalina, with Luma, returns as a playable character in Super Smash Bros Ultimate. This time, she is an unlockable character like in previous Mario games. Rosalina's classification as a lightweight in SSB4 deviates from her classification as a heavyweight in the Mario Kart series. However, Masahiro Sakurai stated on a Miiverse post that the reason for this is because of her possessing an anti-gravity effect. Attendants at the 2007 Whobby Game Festival claimed to have seen an Assist Trophy of Rosalina in a demo of Super Smash Bros. Brawl. However, no evidence has been seen verifying the veracity of this claim, and there is no leftover data in the final game that indicates Rosalina was intended to be an Assist Trophy. Super Smash Bros. for Wii U marks the only time Kerri Kane voices Rosalina on a Wii U game instead of Laura Faye Smith. This was possibly done for consistency reasons. Rosalina and Bowser Jr. are the only playable Mario characters to have debuted in the 21st century. However, Rosalina is the only one out of the two that debuted before Brawl to not possess a trophy or reference of any kind in said game. Rosalina is currently the tallest female playable character in the Super Smash Bros. series, having overtaken Samus Aran as of SSB4. She is also the tallest playable protagonist in the Super Smash Bros. series, as the characters who are taller than her (Ridley, Ganondorf, King K. Rool and Bowser) are antagonists. Rosalina is the first playable character to have a unique victory theme from other characters of her universe who is not a villain nor an anti-hero of any sort. This distinction would later be shared with Lucina, Robin, and Corrin. Rosalina is also the only playable Mario protagonist to have a unique victory theme. In the Super Smash Bros. series, the underside of Rosalina's dress features a pattern similar to a deep blue starry sky. However, this is not the case in her home series, in which her dress's underside is simply white.